Melt 2 tablespoons butter in a wide skillet. Add the onion and cook over low heat, stirring occasionally. While the onion is cooking, blanch the artichokes in boiling salted water for 10 minutes, then remove them to a bowl. Using the same water, cook the celery root for 3 minutes and then the potatoes for 1 minute. Add the celery root and potatoes to the pan with the onion. Slice the artichokes very thinly, add them to the onions, and give them a stir so that all are coated. Cook until the onion is golden and soft, then turn off the heat and season with a scant teaspoon of salt and freshly ground pepper. Taste and correct the seasonings, if need be. Cover the bread with the milk and soak until the bread is mushy, about 5 minutes. Squeeze out the excess moisture, then toss it with the parsley, garlic, and Parmesan cheese. Preheat the oven to 375 degrees. Butter an 8-inch-by-10-inch oval earthenware gratin dish. Add the vegetables. They should come up only an inch or so on the sides of the pan. Cover them with the bread mixture, dot with the remaining butter or drizzle with olive oil, and bake 35 to 40 minutes. If the top isn’t brown by then, run it under the broiler. Let it rest a few minutes, then serve. 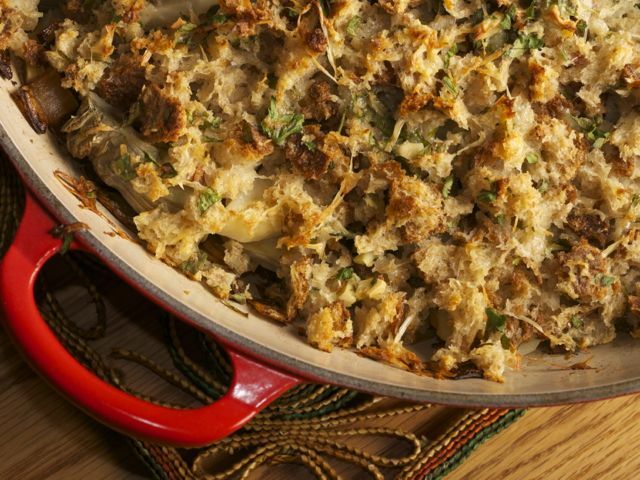 Culinate editor's notes: Any flat, wide ovenproof dish or pan can be used for a gratin. Also, if you're pinched for time, you might consider using frozen artichoke hearts for this dish. We substituted Trader Joe's version, which worked well. Finally, we used a more crouton-like crust, preferring to utilize the crust of the bread as well as the crumb — which also worked well.